SCVHistory.com | Wyatt Earp's Letters to William S. Hart. Wyatt Earp's Letters to Bill Hart. •Written at a time when the sun was setting for both. ©True West magazine, June 1968. Magazine(?) article sent by William S. Hart to his friend Wyatt Earp in December 1926. 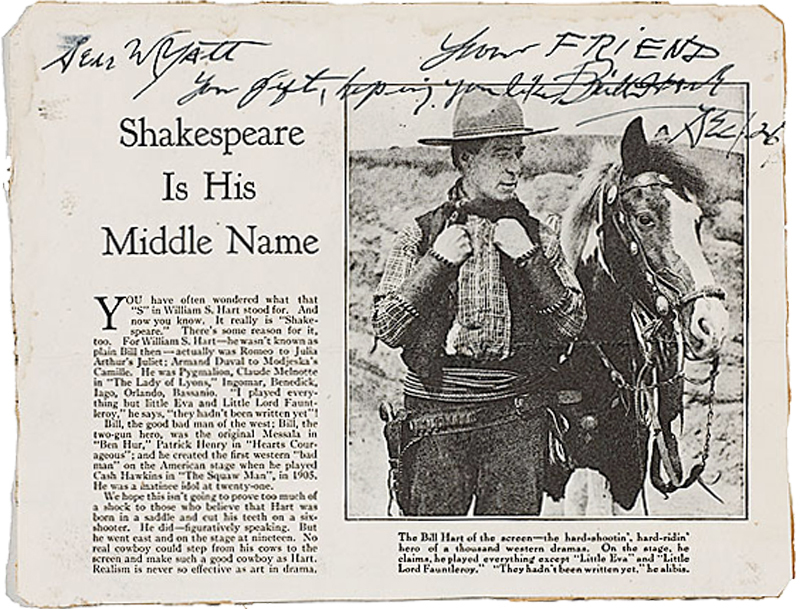 Article claims Hart's middle name is Shakespeare; Hart doesn't confirm or deny it in his hand-written note to Earp. Thousands of words have been penned about the famed Wyatt Earp; much fewer have been written by him. In fact, I had seen none at all until I came across the Earp letters at the William S. Hart Ranch (now a park and museum) in Newhall, California. There are about two dozen of these historic letters written by Wyatt Earp to the late movie idol, William S. Hart. Most of them are in long hand but a few are typed. 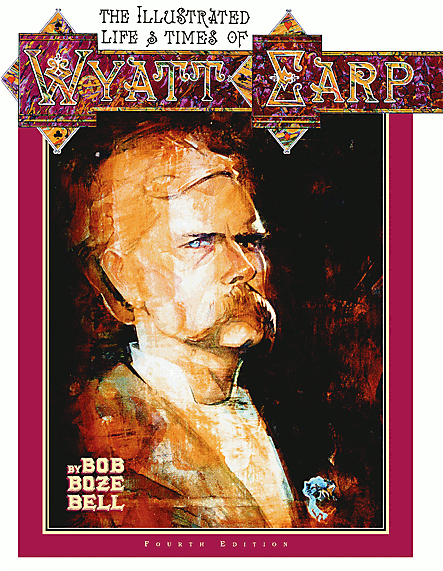 The Earp letters reveal his politics and anger over what he called the many untruths which were in print concerning his colorful life. On Nov. 13, 1928 Wyatt Earp wrote, "Here is something that will make you laugh. I picked [Al] Smith for the winner of the election; just in my mind, you know, so it didn't cost me anything — no new hat to buy nor any peanuts to roll along the thoroughfare with a tooth-pick nor anything else to make me wish I hadn't. It just furnishes my friends a lot of fun by guying me. Hoover will make an excellent president, and the nation will have no regrets at having chosen him." 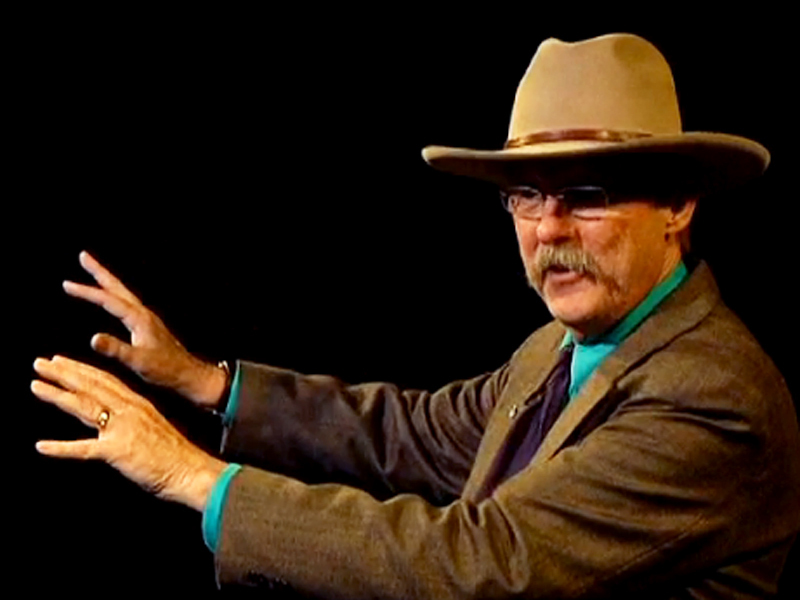 Click image to watch True West Executive Editor Bob Boze Bell's presentation, "Wyatt Earp: Hero or Villain?" at the 2011 Santa Clarita Cowboy Festival. On Nov. 16, 1924 Earp wrote to his friend Bill, "Even the paragraph about Doc Holliday shooting a man in Los Angeles was without foundation. Holliday to my positive knowledge never had been in Los Angeles." Published here, for the first time, are some of the most interesting letters which Wyatt Earp penned to America's favorite "strong and silent" cowboy. I am sending you the quirt that I promised you some time ago and I am also adding a word of apology for the delay. My time has been so occupied with business affairs during recent weeks requiring my absence. I just did not get the opportunity to mail the quirt to you. Although I have though of you. I believed I explained to you the quirt was made a number of years back in 1885 by a Mexican woman who was serving time in the penitentiary at Yuma, Arizona for the murder of her husband so you can see that a good quirt was made by a bad woman. It ought to stand hard usage and last a lifetime and I am sure it will. In your leisure moments may you occasionally remember that this is just a token of appreciation from me who hold you in deepest regards and esteem. This interesting letter was written by Mrs. Wyatt Earp, and it shows her concern over her husband's press image. I am leaving for the mines today where my husband is at present and fully acquaint him of all this unpleasant affair and also tell him your genuine kindness to him. Accept our heartiest congratulations and wishing you and your wife every happiness in the world of which you are more than worthy. I wish to thank you once more for all you have done. The article mentioned in Mrs. Earp's letter made Wyatt Earp mad as hell. It had at least one glaring untruth. It said that Wyatt Earp was killed in Colton, California. He was very much alive at his mine in Vidal, California. I made a copy of the article from the files of the main library in Los Angeles. Here it is in full. "This old type faded out with the 'round-up' of the Earp, Dalton and Evans-Sontag gangs. The Earps were not really of the western bandit type, for they usually remained in the background, while their confederates confronted danger. They were of the swaggering kind now seen on the movie stage. "In the Earp gang were four brothers, Virgil, James, Wyatt, and Morgan with J. (Doc.) Holladay and Frank Stilwell. This gang had been driven out of Dodge City, Kan., by the late Bat Masterson, then Chief of Police and a noted gunman. The gang selected Tombstone, Arizona as the base of their operations. "Stilwell after his confession had gone to Benson. As the train bearing the Earp gang entered the station, Stilwell was on the platform, Virgil Earp stepped off, shot and killed Stilwell and the train passed on. There was no arrest. "The Earp gang then came to Calif. 'Doc' Holladay located here. Virgil and Jim Earp went to San Bernardino, where one opened a saloon and dance house and the other a faro game. Wyatt Earp located in Colton where he was killed. Finally the authorities suggested that Virgil move on. He moved, leaving a trail of debts. He died at Goldfield with his boots off." The article must have been quite a shock to the Earps. In a later letter you'll read where Wyatt Earp did something about what he called so many untruths. In this next letter Earp tells of his joy at the birth of William S. Hart Jr. The meaning of the first part of the letter isn't clear. Am inclosing a letter from Mr. Lake which is self explanatory. I was rather surprised Mr. Leussler told him he had spoken with me. If you will recall it was agreed that he was not to tell ... we had met. I cannot understand that and so presuming your good nature for your valuable advice in this matter, will you kindly return the inclosed [sic] letter to me. I want to thank you Mr. Hart for all of your wonderful kindness to Mr. Earp and myself. And it shall be my great pleasure to follow Mr. Earp's wishes in having his book dedicated to you — a real friend. Another letter from Mrs. Earp would come under the heading of "fan mail." Just a line to congratulate you upon your new picture "Wild Bill Hickok." I saw it twice with several friends and each time the house was packed. When you appeared upon the screen the applause was wonderful. Am happy to say that you have staged a remarkable "come back." William S. Hart often contacted his friend during Wyatt's stay at the mines. I am mighty glad to hear from you. I am returning Mr. Sutton's letter which I presume you want to keep. Sutton has been a great admirer of my pictures for many years. I have many letters from him. His account of the opening of the Strip from the Oklahoma side is most interesting. The picture which I have just finished, "Tumbleweeds," shows the action which takes place on the other side starting at Caldwell, Kansas. In reference to the letter from Mr. Hammond, you will notice that he says he will write to Scribner's and tell them the article published was not correct. I am tired of seeing so many articles published concerning me which are untrue. This morning's newspapers announces [sic] the passing of Tex Rickard. Poor Tex it seems sad that he should be cut down, or his years cut short; just at the time when life was at its full tide. Such is the fate that happens to many men when they are going strong. Jack Dempsey has lost his best friend. All of which reminds us that the world moves on, and age must make way for ... youth. Webmaster's Note: William S. Hart was one of Wyatt Earp's pallbearers. The others were F. Dornberger, George Parsons, John Clum, Wilson Mizner ... and Tom Mix.